In December 2016 I met with the three people above and spent a cloudy and cold Sunday afternoon giving them an overview of Clinton County Kentucky by answering their questions about the county and by driving them to various places in the county including the town of Albany and Lake Cumberland to the north of Clinton County and Dale Hollow Lake to the south. 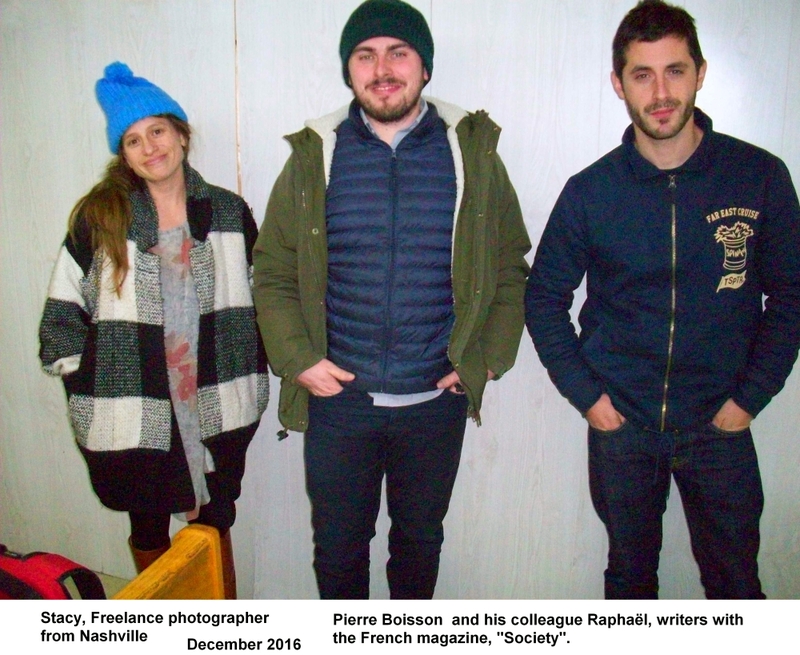 Their purpose is to write a long magazine article about a rural county in the United States for readers of the French print magazine, "Society". The main things they wanted to know were the history and the culture of Clinton County and how it might be alike and different than other counties in the state and the surrounding area. The rest of this are my answers to those questions. Settlers, mostly from Virginia, began to drift into the area that is now Clinton county in the late 18th century from about 1780 to 1810. They found an area of mountains and rolling woods dominated by what later came to be known as Sewell Mountain and Poplar Mountain on the east side of the county. These mountains are in the westernmost foothills of the Appalachian mountain chain. This was an area of mixed mesophytic hardwood forests on a limestone substratum. Only on the very high peaks of the mountains did they find the sandstone and pines that are common in the Appalachians to the East. The gently rolling areas were considered to be suitable for agriculture once the forests were cleared. So they set to work cutting trees and building cabins and making room for cattle and horses and pigs and chickens and children. Many of these settlers were the younger sons of Revolutionary war soldiers who had been paid for their service in the war with grants of land (often 200 acres) in the mostly unexplored lands "across the mountains" in what were to become the states of Kentucky and Tennessee. Since at that time the older son inherited the family plantation, younger sons would have been left landless except for these land grants. In 1792 Kentucky county of Virginia became a state but in 1780 it had itself been divided into three counties, Lincoln, Jefferson, and Fayette. Clinton County was created in 1835 from parts of both Cumberland and Wayne Counties which were themselves originally a part of Lincoln County. By the time of the Civil War in 1860 the county was a place of family farms devoted to crops and livestock with little wealth and no slaves like those plantations found in the southern states and in western Kentucky. Thus these pioneers had little in common with the plantation owners who supported the Confederacy and, although the county was divided in its loyalties, most were staunch Union supporters. After the war many of those who had supported the Confederacy were made to feel unwelcome and soon left the county. From that time forward the county, like most of the Appalachian counties in Kentucky, have been loyal members of the Republican party which was the Union party. It is interesting to note that these loyalities are still there due to being taught from one generation to another without question and without consideration of the fact that times and parties and issues have changed. I also find it interesting that so many who now call themselves Republicans display the Confederate flag as a symbol of resistance to government. I wonder what their original Republican ancestors from the time of the Civil War would think of that. See The Killing of Reuben Wood - a story of Champ Ferguson, a rebel sympathizer and murderer from Clinton County. After the war Clinton County returned to its peaceful days of farming and going to church on Sunday morning, Sunday night and Wednesday night. From 1914 to 1918 many of the men from the county served in World War I and came back to the county with a more cosmopolitan outlook. In 1919 the first airplane came to Albany, it circled around over town two or three times and finally landed in a field where the present fairground is located. Of course it was just a large pasture field at that time. The pilot lowered the plane a little too fast, and ran into a fence, crushing one of its wings, this happened about 2 p.m. By three o'clock all of the surrounding schools had dismissed and the teachers brought the pupils to see the plane. No one in Clinton County had seen an airplane except soldiers who had returned from World War I, or others who had been to a large city. Albany was somewhat isolated and all roads leading out from town were dirt, also was forty-six miles from a railroad. Most people did not travel very much or very far then. There was much excitement over the plane crash but no one was hurt. Two women were in the field next to where it landed gathering pumpkins, they had already picked up their pumpkins and started home, when they heard the noise of the plane. They threw their pumpkins down and started running, it was then that they looked up and saw the plane. When they ran into the house, one of the women told her husband there was the strangest thing going through the skies, and that they thought any minute it might fall on them. He explained to them what it was since he had read about them and seen pictures in the paper during the war. "Well," said one of the women. "I never seed such a thing in all my life, and I am sixty years old. I said when I saw it that it looked like an eagle with a bell tied on it, like the one I saw over in Fentress County the other day." Well, anyway the pilot wasn't hurt and he soon got the wing repaired that was damaged and flew away. At the end of 1920s the Great Depression was caused by a stock market crash caused by the practices of the banks and the laissez-faire policies of Republican governments under Coolidge and Hoover much like the great recession of 2007 and 2008 was caused by a policy of deregulation and deficit spending by tax cuts in a time of war during the Bush administration. The effect on the rural counties of the South such as Clinton County was devastating and led to a great migration of people from the South to the Northern states where there was more industry and thus more opportunity for work which would pay enough to support a family. The out migration from Clinton County which had actually began in the early 1920s continues to this day. Each year about one hundred students graduate the local high school. 30% to 50% of these immediately leave the county for higher education or for work. Although some of these return, most do not. The real problem is that those who leave are generally the most intelligent and the most ambitious leaving the least imaginative behind. After almost a century of this happening every year, it is easy to see that the average intelligence of those living in the county can be adversely affected. This process exacerbates poverty in the area. Schools were slow to come to Clinton county and to this day most local people think that the school system has three main purposes: To serve as a source of employment for the friends and relatives of school board members, to act as a babysitter for kids while the parents work and to entertain everyone by means of school events, particularly basketball games. The Tennessee Valley Authority which built the system of dams and lakes to supply electricity to the people of the area and which also resulted in a major increase in tourism giving a new source of income beyond that offered by farming. Dale Hollow Dam was completed forming Dale Hollow Reservoir in 1943 and Wolf Creek Dam formed Lake Cumberland in 1952. Clinton County became a Mecca for northern vacationers who wish to boat and fish on the lakes. The Agricultural Adjustment Act and the Agricultural Extension Service which gave technical help to farmers making their efforts much more efficient. The Civilian Conservation Corp and the Works Progress Administration giving work to the unemployed. Many of the roads in the county and outside the county were paved during this period affording access to more of the world by those who had been isolated opening up markets and travel opportunities. Social Security giving older Americans some stability in their waning years and adding their economic power to the local economy. The FDIC protecting people's bank accounts from the losses experienced in earlier times. The GI bill providing free educational opportunies for veterans returning from the war and loans for veterans to buy a home. Price supports and marketing quotas for tobacco farmers. Burley tobacco was the main cash crop in Clinton county until the tobacco program was ended during the administration of Republican, George W. Bush, in 2004. Even though these programs were the economic salvation of the area most of the local people hated Roosevelt and Truman because they were Democrats and these locals had been taught from birth that they were Republicans and thus must hate and oppose Democrats. There was the same effect when President Obama saved the economy after the Great Recession caused by the policies of President George W. Bush and expanded medical care with his Obamacare program. In that case there was also a racial element to the opposition to the Obama administration. In the presidential election of 2016, 82% of voters in Clinton County voted Republican even though the Republican policies were pretty much the same as those of Bush. From the 1950s until almost the end of the 20th century shirt factories in Clinton County provided employment for many, mostly women, laborers giving many farm families an income in addition to farming. Medicare and Medicaid paying for medical care. The Job Corps and Neighborhood Youth Corps employing the school dropouts of the area. Head Start providing educational opportunites for younger children and Upward Bound giving a path to college for high school graduates. The Food Stamp program providing food for those otherwise unable to afford it. The Community Action program which set up Community Action agencies which were a partnership of federal, state, and local governmental agencies to work together to empower individuals and families to attain greater economic success. Federal aid to public education making more money available to local school systems. Consumer protection programs to protect the consumer against unsafe products, misleading information and deceitful business practices. Under Title III of the 1964 Economic Opportunity Act, Special Programs to Combat Rural Poverty, the Office for Economic Opportunity was authorized to act as a lender of last resort for rural families who needed money to help them permanently increase their earning capacity. Loans could be made to purchase land, improve the operation of family farms, allow participation in cooperative ventures, and finance non-agricultural business enterprises, while local cooperatives which served low-income rural families could apply for another category of loans for similar purposes. The 1970s until the present saw the further demise of agriculture in the county with the end of the tobacco program in 2004 and the closing of the shirt factories at the end of the century but we did get a chicken processing plant and the continued growth of the tourist industry as well as income from the beef cattle produced on local cattle farms. Although Kentucky is widely seen as a state of racehorses and bourbon, the actual economy has been mostly dependent in the past on coal, timber, tobacco and cattle. Another trend beginning in the 1970s was an influx of retirees to the county both from those with roots in the county returning from the north when they retired from their work there and by their northern friends and neighbors who had become acquainted with the area due to summer fishing trips to the lakes. Another source of immigration to the county was by those attracted by the oil boom of the eighties when high oil prices increased drilling and many producing oil wells were discovered in the area. Also in the 1970s a coal company began strip-mining the top of Poplar mountain for the coal seams there. Poplar mountain contains the only commercial coal in Clinton county and it had been deep mined by means of a mine in the head of Duvall Valley for years but someone decided in the 70s that it was more efficient to just take off the top of the mountain. After a few years the strip mine was no longer profitable and was abandoned. Enacted in 1975, during a Republican president's administration, the initially modest Earned Income Tax Credit has been expanded by tax legislation on a number of occasions, including the widely-publicized Tax Reform Act of 1986, and was further expanded in 1990, 1993, 2001, and 2009, regardless of whether the act in general raised taxes (1990, 1993), lowered taxes (2001), or eliminated other deductions and credits (1986). Today, the EITC is one of the largest anti-poverty tools in the United States and has been a benefit to many Clinton county families. In the 1990s another Democratic president, Bill Clinton, started a program he called Empowerment zones which made available federal money to combat poverty. Using this money, the $13 million Kentucky Highlands Empowerment Zone Developmental Venture Capital Fund made fixed asset and working capital financing available to businesses in Clinton, Jackson, and part of Wayne counties. The first female Clinton county judge, Charlene King, used empowerment zone money to attract the Cagles Keystone chicken processing plant to the county, build a Learning center, a library, an EMS building, and to help finance a major addition to the local hospital. In 2012 and 2013 the per capita IRS taxes collected by the federal government were about $5,727 in Kentucky but the per capita federal money spent was $10,927. In general, the voters in Clinton County seem to believe that they are overtaxed and have no idea of the benefits they receive from the government. I am sure that the ratio of benefits to taxes in Clinton county is even greater than the state average figures above. In the mountains to the east of the Cumberland Plateau which begins about 20 miles east of Clinton County there is little good farmland. As a result people are generally employed in the coal and timber industry by companies who own the timber and mineral rights and are far removed from the areas where they employ people and exploit the land. In central and south central Kentucky the majority of people have traditionally been farmers who owned and worked the land themselves. This makes a marked cultural difference in the way people look at life between the two areas although they may have much in common politically and in the fact that there is a high rate of poverty in both areas. Pierre asked, "If all this is true, why would people, so consistently vote Republican and why are so many confederate flags on display?" My answer is that people are generally ignorant of history and economics and, I suspect, would dispute the truth of the facts I have stated in this history or would say that the social programs of the federal government described here were actually detrimental to the area. There is a general belief that everything should be done as it was in the past tracing back to the civil war and many seem to follow leaders who tell a fantasy story to keep the people supporting the ruling class rather than acting in their own best interests. He also asked, "What are the issues in the upcoming wet/dry or local option vote?" I told him that as far as I know the main idea is that the local businesses benefiting from the tourist industry such as boat docks, motels, restaurants, etc. believe that lack of sales of alcoholic beverages puts them at a competitive disadvantage to areas where sales are allowed and church going people believe alcoholic beverages are evil and it is their duty to prevent others from enjoying them. In the past the churches would have been supported in their opposition to legal liquor sales by the moonshiners and the bootleggers (illegal liquor vendors) but at this time those people have mostly changed their business to illegal drugs such as marijuana and meth because there is more money in drugs than in illegal spirits. Here are some more specific links to some of my web pages that I gave Pierre and Rapha�l. Links to pages on my web site. The Bristow family history is typical of many Clinton County Families. In 1792 William Bristow, a 21 year old man and the second son in his family, migrated to Kentucky from the family farm in Virginia along with his younger brother, Leven. As far as I know they settled and raised families in what was then Cumberland county Kentucky, later to become Clinton County. They were farmers and I heard that Leven was a hatmaker. They came from a family of ten children. Leven found a wife 9 years his junior among the early settlers in the area and they had 7 children. Their second child was a son named Ballard who married an older woman and they had three children. They farmed west of Albany during the time of the civil war. Their second son, Jesse Leven, married into another of the early settler families in the area. They were storekeepers in the Beech bottom area of Clinton County in the later nineteenth century and also had three children, two of whom migrated to Texas. Their oldest son, Samuel William, the only survivor at birth of a set of twins, married a girl from neighboring Cumberland county and went to medical school in Nashville and became a local country doctor in neighboring Wayne county and later in Albany during the first half of the twentieth century. His oldest son, Roy, married a girl from Wayne county, the daughter of a fiddler and the granddaughter of a farming family headed by a Union Civil War soldier. About 1922, four years after their marriage and when their only son was two years old Roy and his wife, Lillie, left their small farm on Pott's creek in Wayne county and migrated to Richmond, Indiana where Roy could get a job working on the railroad. In 1929 at the beginning of the great depression Roy was injured in an automobile accident and was unable to work. They were forced to return to the farm in Kentucky and the next year Roy died from complications from his injuries leaving Lillie to raise two young boys on a small Kentucky farm during the great depression. Five years later Lillie returned to Indiana and married a recently widowed man who had been their neighbor there and lived the rest of her life in Richmond. Her second husband, Dan Davis, and his first wife, Geneva Byers, had also migrated to Richmond, Indiana from Clinton county Kentucky. Dan worked for the Richmond Gas company. Roy and Lillie's oldest son, Jesse, my father, left high school in Richmond when he was drafted into the army and he fought in the Pacific for four years in World War II. During that time he married my mother, a young girl from a french family of 13 who was raised near Cookeville Tennessee but had come to Richmond, Indiana at the age of 15 to join two of her older brothers who worked on Indiana farms. She came to Indiana to get a job as a housekeeper and nannie and later during the war became a factory worker as did my father when he returned from the war. In 1949, Jesse's grandfather, Dr. S. W. Bristow, asked Jesse and Nora to return to Kentucky to live on one of his farms in Clinton County to care for him and his wife in their declining years. They did so and, although I was born in Indiana, I grew up and went to school in Clinton County. Immediately after high school, I married a local Clinton County girl and left the county for college and became a forester in southeastern Kentucky. After the death of my father, I returned my family to Clinton county so that I could manage the family farm and I found a niche there as a computer consultant introducing computers to local businesses. Both my sons left Clinton County after graduating high school also. Overall the history of my family is similar to the history of a lot of families in the area and, perhaps, gives some insight into the history of the county. When I returned to Clinton county in 1979, I brought my computer with me and thus was the first person in Clinton county to own a computer. I made a deal with the owner of a local Radio Shack. I would help him sell computers, which he didn't know were available to him to sell, and we would split the profits. Since 1980 I have furnished computer services to about 100 businesses in Clinton County and another 45 or so in the surrounding area. Of these I had about 40 customers in Clinton County by 1990 and 80 by 2000 with another 20 from 2001 to 2010. The census showed only about 186 businesses with employees in the county in 2015. In addition to privately owned businesses I also introduced computers to the Albany City Hall and the Water Department (1988) and the elementary school (1986) and the local Hospital (1986). My customers included retail establishments, oil purchasing companies, a cheese plant, boat docks, shirt factories, lawyers, newspapers, accountants, banks, farms, gas companies, a houseboat factory, insurance agents, sawmills and some individuals. However, much of my business during that period was in the medical sector including the two doctors in Albany and a couple of pharmacies beginning in 1983 and the two (later three) doctors and two pharmacies in Burkesville beginning in 1997, a doctor in Glasgow beginning in 2004 and a doctor's office in Campbellsville beginning in 1995. I also computerized a chain of a dozen adult day-care centers beginning in 1997. In 1990 I was pretty sure that Clinton county had a larger proportion of total businesses using computers than any other place in Kentucky or Tennessee. About that time a local pharmacist, one of my customers, told me that he didn't see how a pharmacy could operate without a computer system although he had the only pharmacy, probably within 150 miles that was computerized. The office staffs at my doctors' offices told me that when they attended area or state wide meetings of doctor's office staffs concerning patient and insurance billing, there was seldom anyone there besides them who had a computer system in their office. Most medical facilities began to computerize in the 1990s but it was after the turn of the millenium that computers were common in medical offices. In 1995 I had the only computer in Clinton county with internet access and I took a computer to a meeting of the local Chamber of Commerce to show them the internet and ask them to spend $500 to let me set up a web page promoting Clinton County on the internet. At that time only the two larger cities in Kentucky had an internet presence and I thought that it would be a boost to the county if, as the internet expanded, Clinton county were one of its pioneers. However, the members of the chamber were not sure that the internet was not just a passing fad and besides, if they did commission such an effort, I would be the only one in Clinton county who could see it since no one else had internet access. So they declined. That year my son in elementary school got an "A" on a paper he wrote about a famous person, although I told him he would get an F for plagiarism because he simply printed the information directly from the internet without even reading it himself. The teacher gave him an "A" because she had never heard of a student using the internet before. In the early 1980s an owner of a building supply in neighboring Russell Springs asked me to install a computer system in his business due to pressure from his son, a college student who had learned about computers in school. I set up my basic accounting system including general ledger and accounts receivable. It could also do payroll, inventory control and accounts payable among other functions, but he was not interested in going that far. After he and his wife had used the system for a couple of months I was in Russell Springs and I stopped by to ask him how he liked his new system. 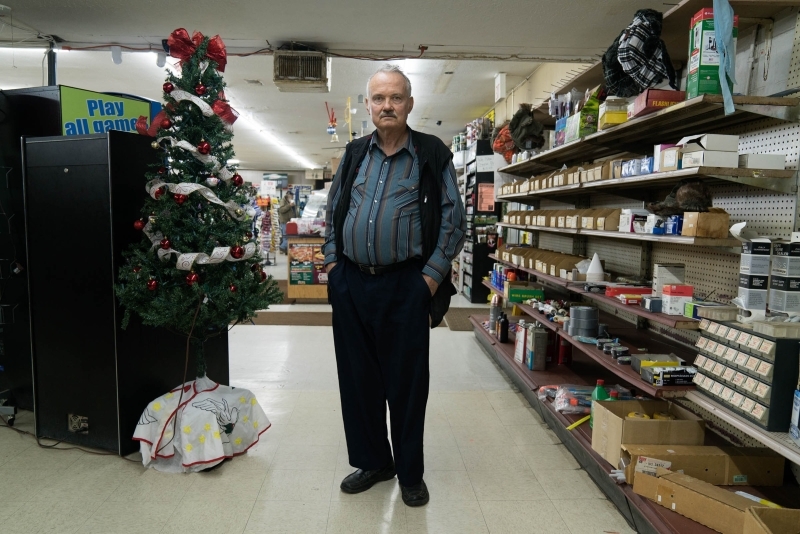 He said that it was a lot of trouble because now his wife had to put all his sales and purchases into the system where that work had not been necessary before. "Well," I asked him, "How did you bill your customers before the computer system?" "We just had a barrel under the counter. When anyone would charge their purchases, we would throw our copy of their ticket in the barrel. When the customer was back in and wanted to pay their bill, we would dig through the barrel and find all the tickets with their name on them that we could, add them up and charge them that amount." "What if you missed finding some of their tickets?" "It didn't matter because they were still in the barrel and we would find those the next time that customer came in to pay." During the local oil drilling boom of the 1980s a businessman who was an unscrupulous oil promoter hired me to set up computers in his office, supposedly to keep his books. When I taught his secretaries to use the computer system to do accounting one of them told me that they could never get the books to balance as I had taught them because the owner would do a lot of his business in cash and write checks and hide the details from his office staff. It turned out that he did not want his books kept accurately because he did not want to pay income taxes on all his income and so would not report it. He only wanted the computers so that when he toured the offices with the business managers for the country music stars from Nashville they would see the computers sitting on desks with employees working at them and be impressed enough to recommend that their clients invest in his oil business. He also found other ways that he could use computer systems I installed to bilk investors in the oil business. When I set up a computer system to bill their customers for the local water department they had been keeping their customer records manually on stiff ledger cards and preparing the monthly bills by hand. Of course, this was much more efficient and faster when the bills were printed by computer. After they had used the system for over a year, I asked the clerk what she most liked about the new system. She thought a minute and told me that now, when they had a mistake in their ledger cards it was so much easier to find the mistake and correct it because they could just look in the computer for the correct data and use that to correct the cards. They continued using those cards in addition to the computer system until she retired about ten years later because she never understood that the cards no longer served any purpose. After all she had begun her work life in that office and the first thing she had been taught was to keep those ledger cards. In 2016 I was the only person in Clinton county to own bitcoin. The Doctor - Patient Relationship. Garlin Murl Conner - A Clinton county war hero. Under age 65 11% disabled and 12% with no health insurance. 48% in civilian labor force - 42% of females are in civilian labor force. Median household income 2015 $28,025 - 2.6 persons per household. 3,076 people employed in 186 businesses. 784 businesses in 2012 most of which are family farms without employees. 583 of these owned by men.